Another resounding boom is shot across the twittersphere, and just like that another key cog in the 2018 recruiting class was added to the puzzle. Coach Meyer found a way to get another gem, this time in the form of the #1 player in the state of New York, Matthew Jones. Jones is another versatile player who plays on both sides of the ball, but he is was recruited to play across the offensive line. 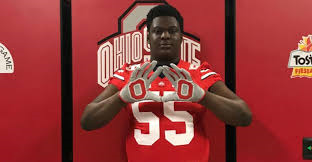 He is listed as a Defensive Tackle and Tackle on his Hudl profile, but the Ohio State coaches see and want him on the Offensive Line. He is currently 6’4″, 315 lbs, but after a couple of months under Coach Marotti’s program, he will improve with time. Jones will join Tackle Max Wray as members of the 2018 recruiting class, the #1 class according to 24/7 Sports. This class has the potential to be another good one and if the dominoes fall in place, they could potentially add Tackle Jackson Carman to the mix.